Frank Lloyd Wright began building this desert masterpiece in 1937 as his personal winter home, studio, and architectural campus. Located on the beautiful Sonoran desert in the foothills of the McDowell Mountains in northeast Scottsdale, the site offers a broad range of guided public tours. Visitors experience Wright’s brilliant ability to integrate indoor and outdoor spaces. The site offers a broad range of public tours everyday, except Thanksgiving, Christmas, and Easter, from 9 am to 3pm. Tours range from one to three hours long. 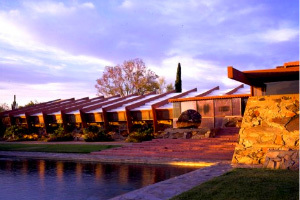 Taliesin West is closed on Tuesdays and Wednesdays during the months of July and August.